Anyone south of the Watford Gap knows what Northern accent sounds like: it’s all ‘oop north’ and ‘’ot pot’. Yet there is no more a single Northern voice than a single British one. And as fun as the stereotypes can be, they also have a real impact on voice over artists. Regional accents can be rare enough in the media and their perception impacts their use. So we’re shining a light on three of the most well-known (and much parodied!) Northern voices. We’ll discuss the history and popularity of the dialects - and our artists will share what they love about them. Scouse is one of the most recognisable Northern voices in Britain, and we certainly have a love-hate relationship with it. It was made global by the Beatles, yet it was polled as the second most unpopular British accent in 2015. It’s also relatively new. Until the 19th century Liverpool still had a Lancashire accent, despite being a port with a melting-pot of European voices. It was only with an influx of Irish and Welsh migrants during the Industrial Revolution that the accent became distinctive. While the accent was originally confined to Liverpool and surrounding areas, it now extends as far as Wales and Cheshire. And the Scouse that gives the accent its popular name? It’s a widely-eaten stew! What The Beatles did for Liverpool accents, bands like Oasis and Joy Division did for Manchester. And as with the Liverpool accent, Manchester’s voice was strongly influenced by the Irish migrants arriving during the Industrial Revolution. There are still traces of this in the modern accent – such as the use of ‘mam’ for mother. Whilst the Manchester accent hasn’t spread much further than the city and its surrounding area, linguists report that the British population is adopting more of Manchester’s vocal traits. This is in part because of the popularity of Manchester’s music and the influence of the long-running soap Coronation Street. In comparison to other Northern voices, the Yorkshire dialect goes back further, having roots in Old English and Old Norse. It’s popular in literature – with classic books Wuthering Heights and The Secret Garden having characters with prominent Yorkshire accents. It’s also considered ‘trustworthy’ and was rated fourth most popular British accent in 2015. Perhaps because of this trustworthiness, the Yorkshire accent was the first regional voice used by the BBC. Wilfred Pickles read the news during the war to make it harder for the enemy to imitate broadcasters. We’ve covered just three Northern voices in this article, but there are endless variations out there. Not to mention plenty of other Northern voices! So what impact does all this have on voice over artists? The good news is that companies are recognising that a Northern accent can be an asset. Northern voices stand out from the RP crowd, and the stereotypes can work in a voice over artist’s favour. The ‘trustworthy’ and ‘down-to-earth’ image of the Yorkshire accent is making it increasingly popular in advertising. The Geordie accent, considered warm and genuine, is being used in customer service and automated phone systems. Despite these changes, RP is still (for the time being) the leader for the UK voice over pack. Older generations find RP more authoritative, and some people respond better to RP than their own accents. And while things have improved for some accents, the stereotypes have a genuine impact on voice over work. Some advertisers have admitted that they would think twice before using a Scouse voice over due to negative associations. In short, it’s an interesting time to be a Northern voice over artist! Here at Voice Squad we’re looking forward to hearing even more. 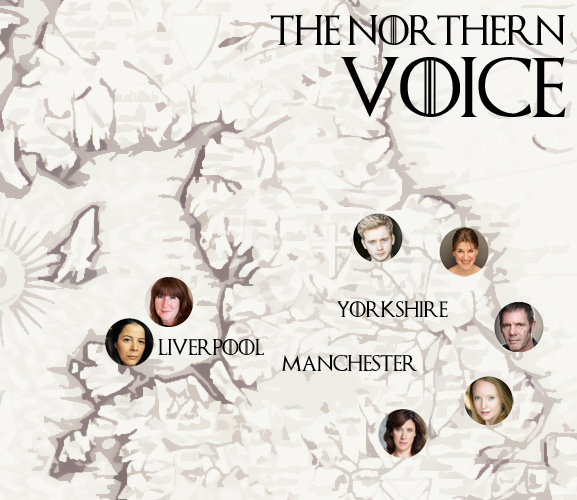 Now that you know a little about Northern voices, you can hear some of the voices in action! Listen to our range of Liverpool voice over artists, Manchester voice over artists and Yorkshire voice over artists.